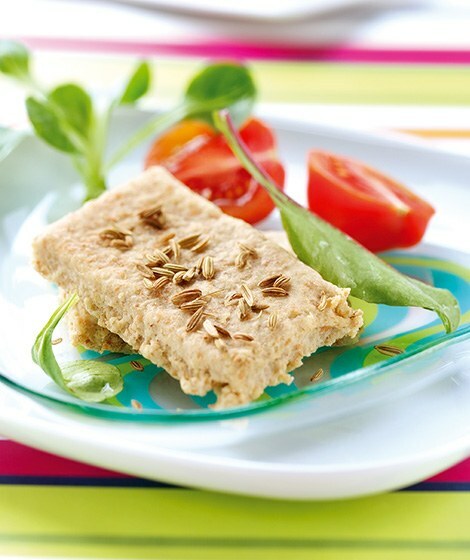 Oatcakes are a healthier option when it comes to snacking. Place all the ingredients in a food processor and pulse until well blended. With the motor on, add 3 - 4 tablespoons of water a tablespoon at a time until it comes together to make a firm dough. Roll out thinly on a floured surface until 3 - 4mm thick. Cut into fingers or triangles and arrange on non-stick baking sheets. Bake for 7 - 10 minutes until pale golden. Leave to cool for a few minutes then transfer to a wire rack and leave to cool completely. Store in an air-tight container for at least a week. Fennel seed has very good digestive properties and its mild aniseed flavour is a very good match for many cheeses including cheddar, which also makes these little oatcakes a very good choice for serving after dinner. Try swapping the fennel seeds for dried chillies - fantastic with soft tangy cheeses such as goat’s cheese. Try making these oatcakes without the salt and fennel seed - they make ideal finger food for toddlers.